It's hard work writing good documentation. Let's team up and share as much of the above as possible -- many of these steps are either not device-specific, or are at least very helpful if written in a way that supports use across projects. If you have never used an electronic water sensor before, try the Coqui project, which is specifically designed for folks who are just starting out. Build a Coqui - a simple device to read a sensor via an audible tone. Can you afford a sensor? Can it detect what you're looking for? Where can you learn more about it? Most of the data loggers on this site are Arduino-based (#arduino) while some are Raspberry Pi-based (#raspberry-pi). As we build out resources for connecting different sensors or different types of sensor interfaces (i2c, analog, etc), let's think about how best to list those guides and support materials here. Help add activities below for connecting specific sensors to different data loggers, and pitch in on researching how these connect here. Nothing yet on the topic "connecting-sensors" -- be the first to post something! 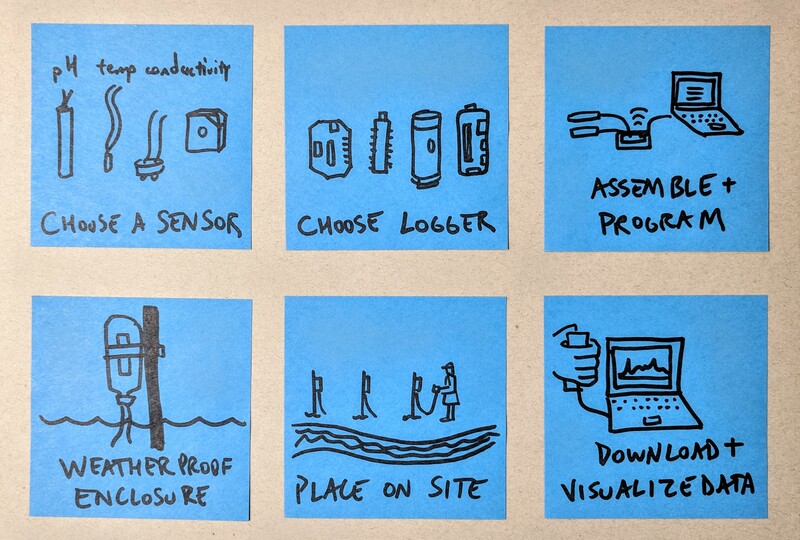 Even though this wiki page is labeled "water sensors," the most accessible modes of measuring water quality parameters are often analog, non-digital methods where you directly observe water (e.g. using a secchi disk to assess turbidity) or collect a sample and test it with a visual method (e.g. color-change pH strips). Several analog tools are included in the spreadsheet, and please add more! In some cases, it may be possible to couple a commercially available probe sensor with a DIY data logger (such as the Riffle, https://publiclab.org/riffle) and an water-tight enclosure to create a lower-cost deployable sensor. Deployable sensors can be extremely useful for long-term monitoring, monitoring in places that are difficult to access frequently, or to document fluctuations in water chemistry with greater temporal resolution.